It's been a while since we've had a sneak peek Saturday. Each week, time would roll around to the weekend and I would say to myself, "Well, I really want to get to this that or the other point before sharing my recent work." And the weeks just seemed to fold seamlessly into one another and here it is a month later. 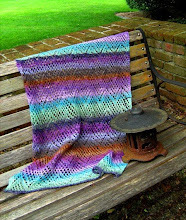 It has been an abundant month at Sunflower Designs. 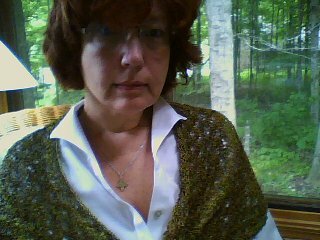 Before vacation, I was sort of burned out on designing, but the 10 days of rest, relaxation, reading (the 3 Rs) and NO KNITTING (gasp) worked their magic on this worn down middle aged knitter. Well, since vacation, I have come roaring back with a vengeance. and last, but most certainly NOT least! 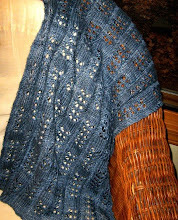 I will be compiling the Mystery Shawl clues into one pattern next week, which all KAL participants will receive. 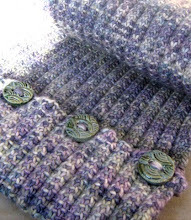 This pattern will include all charts, written directions, & corrections. I will post more pictures then. 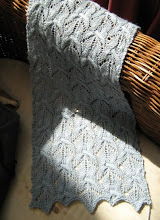 The Mere is coming along - mine is 1/3 complete and my test knitters have made good progress with their knits. 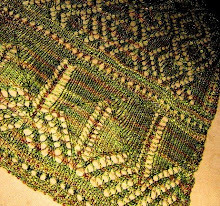 As soon as I get her a little further along and vett the directions for attaching the final edging, I will write her up & get her out to your hot little hands. REMEMBER: Barad Dur & Mere were added to the Two Towers Series AFTER the Christmas gift certificate promotion. THEY ARE NOT INCLUDED IN THE $52 GIFT CERTIFICATE. They are part of the $15 add-on package. THEY ARE INCLUDED FOR THOSE PURCHASING THE SERIES AFTER MARCH 1 FOR $60. 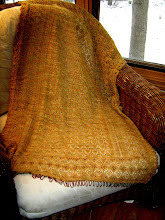 Those of you forgoing the extra 3 patterns, your first pattern will be Treebeard, which I finished this morning and shot out to my test knitters. 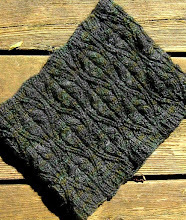 This shoulder wrap features a twist at front and an unblocked lace pattern to evoke the look of moss on the side of the Ents in Fangorn Forest. 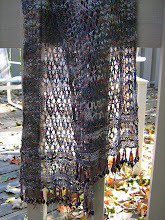 The yarn is Alchemy's Silken Straw in Forest Waltz. 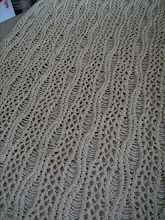 I also have one other new pattern in development that has nothing to do with the Lord of the Rings. 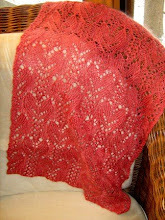 This is the Three Angels Shawl: my first dedicated pattern. It is a fundraiser for the Three Angels Children's Home in Haiti, which includes a school and a hospital. 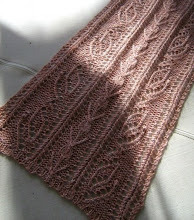 The shawl is knit with Crystal Palace's Mini-Mochi and will be edged with a lace border in alpaca that looks like angel wings. 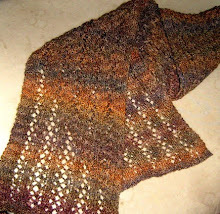 Here is a shot of the shawl stretched out a bit to show the stitch pattern better. These spring days are abundant indeed. Even as new life springs from the earth and our pulses quicken with the scent of fresh possibilities, we move into the summer months with hope in our hearts and joy in our own backyards. 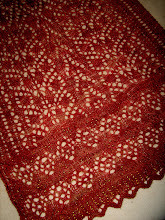 Your Three Angels pattern looks very intriguing. When will it be out for purchase, or did I miss it? Your mojo came back with a vengeance! 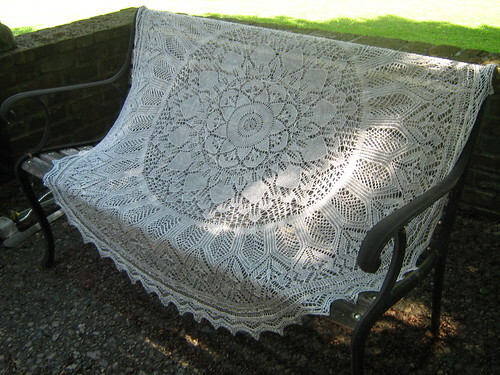 That's a lot of beautiful knitting. I am still working on my In Dreams (and my Dwarrowdelf is in time out for the time being) and it's challenging enough to be enjoyable but not so daunting I can't work on it.